What is peculiar about the sporangia shown here becomes obvious by considering that this chert sample is one of many hundreds recovered from the type locality of the fossil tree fern Scolecopteris elegans , whose stem is known as Psaronius. 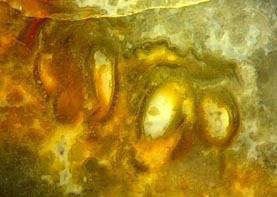 Chert with fern pinnules superficially resembling little creatures had been called "maggot stone" . The large majority of the plant fragments seen in the maggot stones belong to the tree fern Scolecopteris elegans so that it had been assumed  that there were no other ferns growing in the swamps turned into chert. Hence, any detail indicating the presence of other ferns in the Lower Permian cherts from Döhlen basin deserves attention [4,5]. Incidentally, there are more than one piece of evidence for the presence of other ferns in this chert sample: fat pinnules with numerous hairs below (Fig.1), others with big sporangia (Fig.2), sporangia with two conspicuous hairs near the tip (Fig.3), and, as another quite uncommon sight in these cherts, small sporangia apparently not compatible with Scolecopteris (Fig.4). Incidentally again, there are a few mm-size objects in this sample resembling extant fern seedlings, which will be the subject of another contribution. Fig.1: Two cross-sections of sterile fern pinnules of big size, with hairs on the midrib, image width 7mm. This image may be confusing at first sight because the contours of the pinnules are hardly visible. The pinnules are distinctly bigger than those of Scolecopteris elegans, hence most probably they represent another species. Part of the confusing aspect is due to the hairs emerging from the midrib (and from the lateral veins, not seen here). Although hairs on the lower side of the pinnules are not rare, they are seldom seen on photographs or drawings of sections. They are mentioned in  and seen in Fig.4a there on the small pinnules of Sc. elegans. (The scale is erroneous there, not 5:1 but 10:1.) They are also seen in . same scale as Figs.1-3, enlarged in Fig.5. Fig.3 (above): Sporangia with hairs near the tip, cut off on the left sporangium. Fig.2: Inclined section of fertile fern pinnule of big size, image width 3.2mm. The pinnules and the sporangia in Figs.1-3 (same scale) are distinctly larger than those of Sc. elegans. As a queer coincidence, this chert sample offers much smaller sporangia, too, as seen in Fig.4, same scale. They differ from those of Sc. elegans not only by their size but also by their aspect, which becomes obvious by comparing Fig.5 with the figures in . Remarkable are the clustering of 7 or 8 sporangia and their walls consisting of cells arranged in one layer. The latter feature is typical for leptosporangiate ferns, which include most extant ferns and are widely separated, in a phylogenetic sense, from the eusporangiate ferns including Scolecopteris. Fig.5 suggests an interpretation as Oligocarpia, which, according to Zeiller in , has got 3 to 10 pyriform sporangia in circular clusters (sori). Oligocarpia lindsaeoides  from Bohemia has got similar sporangia as in Fig.5 but only 4 or 5 per sorus. 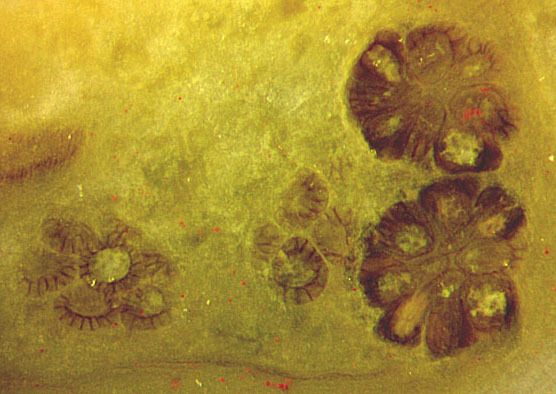 Oligocarpia leptophylla, known from the Döhlen basin as compressions , has got sporangia of similar size, poorly preserved, and arranged in larger clusters with up to 20 per sorus. Apparently the present fossil fragment, well preserved in chert, with 7 and 8 sporangia per sorus seen on the cut face, represents a species that may be placed in between. Fig.5: Uncommonly small sporangia in chert (three times magnified with respect to Figs.1-4), resembling those of Oligocarpia. Width of the picture 2mm. - It provides additional evidence of the existence of more than one Scolecopteris species there. - It reveals a leptosporangiate fern, probably Oligocarpia, having lived in the same habitat as the eusporangiate Scolecopteris. 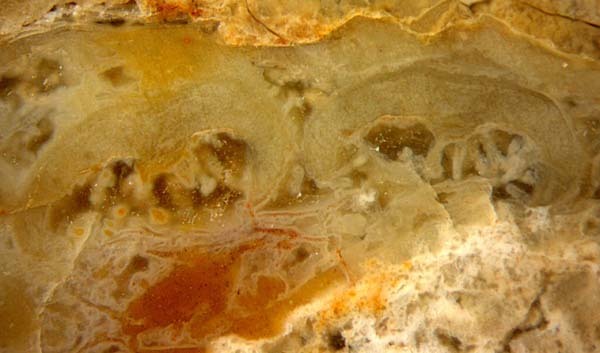 Thanks are due to the fossil collector Gert Müller (Dresden + Düren), who found this chert boulder, from whose cut faces all pictures have been taken, at the "maggot stone" site (at the boundary between the municipalities Kleinnaundorf and Burgk, Freital) in 2003. It is now stored in the own collection under the label Bu7/140. M. Barthel, R. Rößler, H.-J. Weiss: Sächsische "Madensteine" - Irrtümer und Fortschritte. Geologica Saxonica 46/47(2001), 197-202. M. Barthel: The maggot stones from Windberg ridge. in: U. Dernbach, W.D. Tidwell: Secrets of Petrified Plants. D'ORO 2002, 65-77. H.-J. Weiss: Beobachtungen zur Variabilität der Synangien des Madenfarns. Veröff. Mus. f. Naturkunde Chemnitz 25(2002), 57-62.
 www.chertnews.de, Permian Chert News 5: Conspicuous in the chert - synangia of Scolecopteris. M. Barthel: Gibt es einen Farn Scolecopteris arborescens ? Veröff. Naturk. Erfurt 24(2005), 5-11.
 www.chertnews.de, Permian Chert News 17: Microbes, fungi, maggot fern. A.C. Seward: Fossil Plants II, Cambridge Univ. Press 1910, Fig.270B. J. Psenicka, J. Bek: Oligocarpia lindsaeoides  ... from ... Central Bohemia, Acta Mus. Nationalis Pragae, B, Historia Naturalis 57(2001), 57-68.